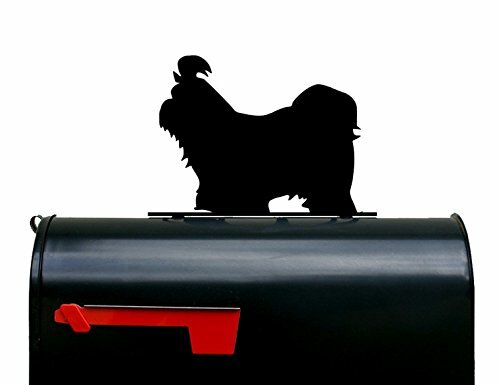 You are looking at a metal mailbox topper sign with a Shih-Tzu silhouette on it. Made from 16 gauge steel and powder coated for a strong, durable finish. The Shih-Tzu measures approximately 10 1/4 in wide x 8 1/2 in tall, while the base measures 11 1/2 in by 3/4 in. It has two 3/16 in holes drilled into the base for mounting. Hardware and mounting instructions included. USPS Priority Mail Shipping. Feel free to message with any questions you might have. Browse our listings for other dog breeds. If you don't see the breed (or species!) you are looking for, let us know. We are always happy to do custom orders! Feel free to message us your ideas and we will be glad to work with you. Please allow up to 5 business days to ship out, as each piece is made to order. If you need it faster than that, let us know and we will try to accommodate. View More In Mailbox Accessories. If you have any questions about this product by NewnanMetalWorks, contact us by completing and submitting the form below. If you are looking for a specif part number, please include it with your message.